and making sure your building is a comfortable space. The last item on that list, however, is not usually something that is top of mind for managers or business owners, but it’s important nonetheless. JC’s Heating and Air can help you make that a priority with our rooftop HVAC system installation and service. We offer high quality rooftop HVAC systems, the best choice for larger spaces like commercial structures. A rooftop HVAC system typically has cooling equipment with simple fans, and they sometimes include heating units. Specifically designed for heavier loads, a rooftop HVAC system is the great workhorse of commercial air conditioning. Unlike other HVAC types, a rooftop unit has all the components, from the coils and compressors to the fans, all housed in one cabinet. Rooftop systems were first introduced in the early 20th century, during which most large businesses were located in crowded urban areas and when there was no space between buildings for large outdoor units. To get around this issue, manufacturers designed rooftop HVAC systems. 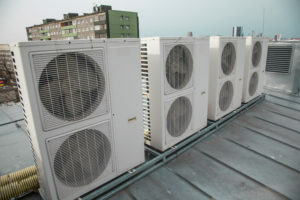 Some commercial buildings still use split type HVAC systems, similar to the ones seen in residential housing, but the rooftop HVAC system continues to be the most popular for business-use due to its space-saving quality and ease of use. By combining state-of-the-art technology, efficiency, and our expertise, we’ll make sure that you receive a long-lasting and sustainable rooftop HVAC system—a system that provides maximum comfort and superior indoor air quality (IAQ) in your commercial structure. When you work with us, we’ll help you choose the right unit for the size of your building or space. That’s because an oversized unit may cost you more money, while an undersized unit may not be able to keep your space cool or warm. Call or contact JC’s Heating and Air today for an estimate or with any questions you might have about a rooftop HVAC system. Contact Us Now for More Information About Our Rooftop HVAC System.